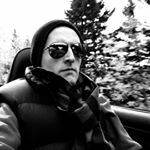 Through four months of 2013, the Fiat 500 has outsold the Mini Cooper by 637 units; the Chevrolet Camaro is 2076 sales ahead of the Ford Mustang and 7803 sales ahead of the Dodge Challenger; and the Porsche Boxster is 21 units out in front of the Mercedes-Benz SLK, and it’s also outselling the Audi TT and BMW Z4 combined. Three very different groups go a long ways in telling the story of where American new car buyers spend their money when they’re looking for something that isn’t a Ford F-150 or Toyota Camry or Honda CR-V.
All the cars you see here combined to sell 52,358 copies last month. That equals 4.07% of the new vehicle market’s April 2013 volume. Compare that with the Ford F-Series’ 4.59% to get a true picture of the grilles you see coming toward you on the highway. 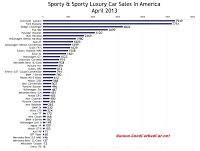 You can click any model name in the tables below to find historical monthly and yearly U.S. sales data. You can also select a make and model at GCBC’s Sales Stats page. 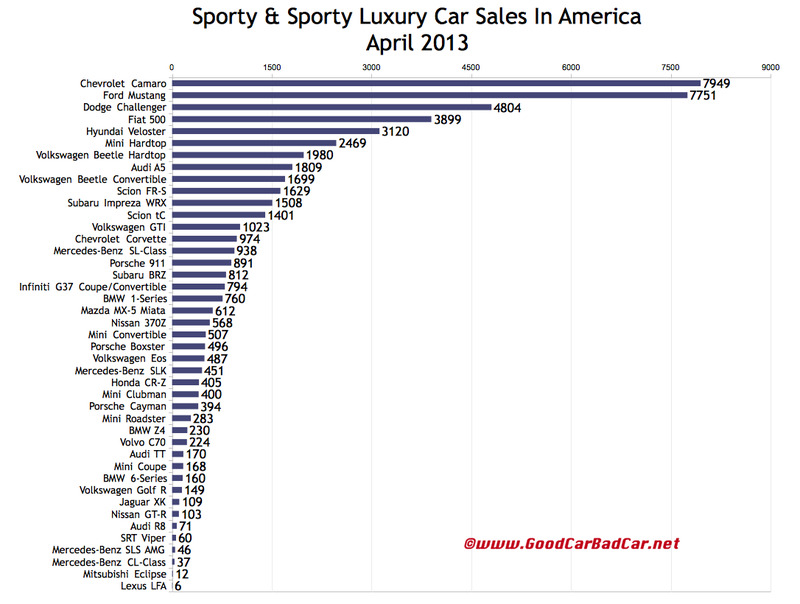 These tables are now sortable, so you can rank available U.S. sporty car sales figures any which way you like. Suggestions on how GCBC should break down segments can be passed on through the Contact page.